Editorial lauds the U.S. Supreme Court’s decision to uphold the MD law ending prison-based gerrymandering, calling on CT to follow MD's lead. The Hartford Courant is cheering the U.S. Supreme Court’s decision to uphold the Maryland law ending prison-based gerrymandering. 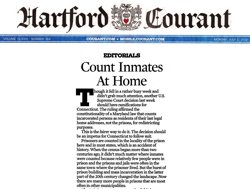 In an editorial on Monday, the paper called on the Connecticut Legislature to follow Maryland’s lead and count incarcerated people at home for redistricting purposes. Though it fell in a rather busy week and didn’t grab much attention, another Supreme Court decision last week should have ramifications for Connecticut. 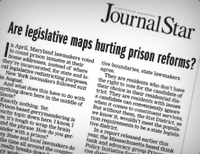 The ruling affirmed the constitutionality of a Maryland law that counts incarcerated persons as residents of their last legal home addresses, not the prisons, for redistricting purposes. This is the fairer way to do it. The decision should be an impetus for Connecticut to follow suit. Connecticut has a head start on ending prison-based gerrymandering, with an active campaign already in place. Although the effort in the previous legislative session was unsuccessful, the Courant editorial insists that it must be a priority for the next legislative session. I note that Connecticut has been on a long march towards fairer redistricting for the last half a century. Fifty years ago, districts were apportioned in a way that gave the residents of some towns hundreds of times the influence of residents in the urban centers. Connecticut rightly fixed that injustice, and ending prison-based gerrymandering is the next logical step. Also, since Maryland-style legislation counts incarcerated people at home for redistricting purposes only, the Connecticut legislature could end prison-based gerrymandering without worrying about inadvertently impacting funding formulas. 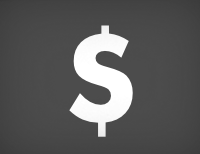 Political power, not money, is at stake here. 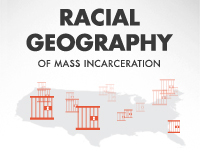 The vast majority of inmates leave prison, and most go home. That’s where they should be counted. The Norwich Bulletin urges the legislature to pass bill to count incarcerated people at home for the next redistricting cycle.